SYNOPSIS - "I want you to find out who in the family murdered Harriet, and who since then has spent almost forty years trying to drive me insane." Henrik Vanger, head of the dynastic Vanger Corporation, is tormented by the loss of a child decades earlier and is convinced that a member of his family has committed murder. Mikael Blomkvist delves into the Vangers' past to uncover the truth behind the unsolved mystery. But someone else wants the past to remain a secret and will go to any lengths to keep it that way. 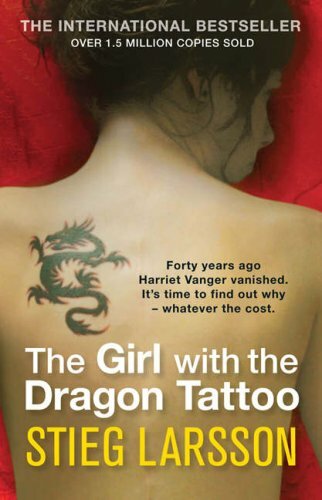 Lisbeth Salander, the enigmatic, delinquent and dangerous security specialist, assists his investigation. A genius computer hacker, she tolerates no restrictions placed upon her by individuals, society or the law. EXCERPT - It was the tiny details that he could easily have missed if he had not been alert: some papers not as evenly stacked as he remembered; a binder not quite flush on the shelf; his desk drawer closed all the way - he was positive that it was a centimetre open when he left. Someone had been inside his office. He had locked the door, but it was an ordinary old lock that almost anyone could pick with a screwdriver, and who knew how many keys were in circulation. He systematically searched his office, looking for what might be missing. After a while he decided that everything was still there. FL Speak - Forty years ago, Harriet Vanger vanished. Its time to find out why - whatever the cost. Thus begins the breathtaking first book of the Millenium Trilogy. A rip-roaring thriller and characters equally amazing. The girl, Lisbeth Salandar is someone to be awed upon. She has an amazing background and even though Mikael Blomkvist is the hero of the story, its the heroine, Salander that garners the most attention and around whom the story is arched. Thriller has a raised its bar....with Lisbeth Salander. The book is an epic roller coaster of steadily accelerating narrative and sublime plotlines. A stellar story, a punk heroine and a splendid location. This book has all that it needs. The good part is, there are two more books after this one. My rating : 4.7 outta 5. yes, its that good. PRICE - INR 350 for paperback by Maclehouse Press. For some reasons, i was not able to read more than 120 pages , but I found the movie and watched that .. OMG ! what a thriller !! totally awesome story .. thriller definitely raised its bar .. and Lisbeth .. what a lady !! hats off to the author.. gonna search and read the second part ASAP !